Few days back US delegation met Gujarat Chief Minister Narendra Modi and they invited Modi to US. 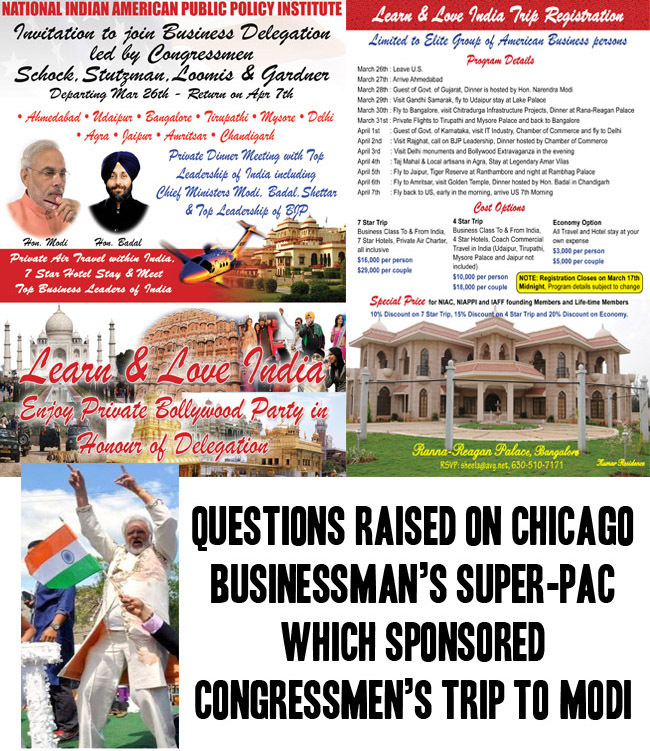 The trip was sponsored by a political action committee (PAC), the National Indian American Public Policy Institute (NIAPPI) founded by Shalabh Kumar, a Chicago businessman. And they will meet Punjab chief minister Prakash Singh Badal. The trip was not cheap by any standard. It is not known if the US Congressmen will pay for the hospitality because they are governed by strict rules regarding accepting gifts and sponsored trips. the delegation would spend, on March 28, as guests of the Gujarat government and attend a dinner hosted by chief minister Narendra Modi. and a dinner hosted by Punjab chief minister Prakash Singh Badal. A ‘Bollywood Extravaganza’ has also been included for the guests. At the press conference, Shalabh Kumar, who hosted the event, said he was aware of the rules restricting American lawmakers from the acceptance of gifts and sponsored trips. Shalabh Kumar is know as Shalli Kumar also. In October 2012 he said in an interview that PAC which he founded, Indian Americans for Freedom planned to spend $ 500,000 in the eighth district race. On August 17, 2012, the National Indian American Coalition(NIAC), another PAC founded by Kumar. On 9/9/2012, Kumar sent a letter to the Federal Election Commission seeking the termination of NIAC. And In December 2012 the Federal Election Commission sent a letter to Kumar saying that the commission has accepted the termination. National Indian American Public Policy Corp and the National Indian American PAC have the same office bearers. Majority times all US and European Delegate trips are sponsored by the groups supported by the supporting groups and political leaders they come to sign contracts which benefit to the rich people of both countries including politicians. 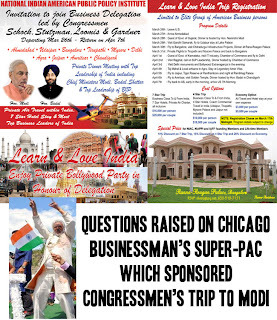 Advertisement of the trip organized by an Indian American political action committee.